Bali. The name itself carries a certain faraway mystical quality to it. You would’ve heard of its blue and white magic beaches, ancient temples, steep volcanoes, deep forests and patchworks of the multiple greens of its paddy fields. Most importantly, it has a freshness to it, as if the entire island is a newly blossomed wonderland. Secluded, adventurous and stunningly beautiful, the island of Bali has been making waves in the world of travel since the first Dutch adventurers set foot on it. Today you can easily follow in their trail with the help of the multiple Bali packages on offer and determine for yourself what captivated them so thoroughly. Yes, these are magnificent temples built with the highest quality of craftsmanship. Add to that, the spectacular settings that these temples find themselves in, perched on a distant rock or crouching in the dense cover of an equatorial forest and you will find that rare quality that makes places memorable – the ‘atmosphere’ of ancient adventure. Though people have been here before, you’d still be able to channel the awe experienced by those who first discovered these masterpieces. Tanah Lot temple dedicated to the god of the sea/water Baruna, for example, is located on top of a rocky outcrop where the land meets the sea and is constantly witness to crashing waves. The Ulun Danu Beratan stands tall and proud besides a reflective lake with Bali’s central highlands in the background. Many such visual wonders await those who walk on Bali’s legendary temple trails. Speaking of legendary, that would be the first word to come to mind when you see a Bali sunset from one of its innumerable beaches. Pantai Batu Mejan or Echo Beach is where you can watch the sun come down while surfers catch the last big rollers of the day. Tegalwangi Beach, considered amongst the hidden beaches of Bali is another cliff ringed wonderland where the end of a day will be added to the memories of a lifetime. Most of the popular beaches are set up to help you and the special person in your life spend quiet moments together as have dinner by lamp light and the sea washes over your feet. 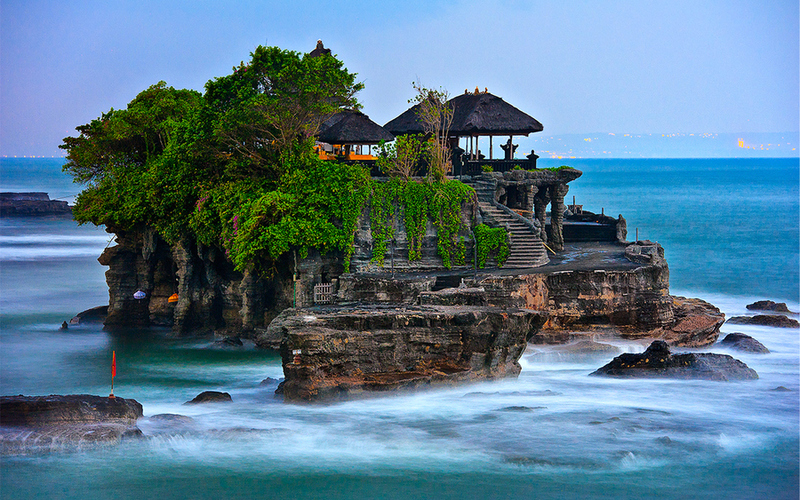 No wonder then that Bali is a regular feature of all lists of most beautiful honeymoon destinations in the world. One look at these Bali honeymoon packages and you’ll know that those looking to create some great memories of togetherness can do so. Bali is nothing if not luxurious, no doubt a great reason why it draws so many honeymooners in. The restaurants are top notch and down in Nusa Dua, you can even enjoy a cave dinner with candle light, good food, the sound of the ocean and your loved one for company. The Balinese spas with their skilled healers and masseuses bring luxury to a whole level. The art of pampering your body is an ancient art as well and Bali is the best place to experience its magic. Not to forget that every hotel or villa in Bali has been developed in the most exquisite of locations, each one different from the other but all fully conscious of retaining the authenticity and culture of Bali. Full moon parties are available for those who seek them and so are hidden corners of pristineness for those tired of the others, all in a day’s work for Bali and its friendly citizens. Most of what needed to said about Bali has already been said, by us or some other write-up. It is for you, the reader, to take it up further. If you do, you’d discover a whole lot more to Bali and pages of content would run short. You may come back and say that “Hey, you completely missed telling us about this awesome thing!” That’s exactly why we want you to go. There’s too much to tell and we didn’t want to keep you waiting. Previous article10 Best Asha Bhonsle Songs You Need To Hear On Her Birthday! Next articleThe Secrets of Sri Lanka Unfolded!